Lettuce love being grown in raised beds because the open soil structure is ideal for them. They also are not particularly picky about feeding as long as minimal feeds are given. Essential though for growing good lettuces is lots of water and a position that protects them from strong sun from early may onwards. Lettuce grow best in cool well-watered situations. Taste and space are the keywords when selecting lettuce varieties for growing in a raised bed / container. You want the maximum crop with good taste (and sometimes colour) in the smallest amount of space. The seed catalogues list a huge variety of lettuce seeds and the choice can be almost overwhelming. Which variety of lettuce you grow in your raised bed or container is a matter of personal choice but we strongly suggest that you grow a compact small variety. Our recommendations are Little Gem and Lobjoits Green (both cos type lettuce) and Tom Thumb. All have good taste and are compact growing lettuce. Star to sow lettuce in raised beds or containers from late of March onwards, early April in cooler areas. Don't make the mistake of sowing all your lettuce seed in one go, you will end up with a bumper crop, too much eat over a ten day period and then nothing. Instead, sow a few seeds each week so that they don't all mature at the same time. You can continue to sow lettuce up until mid August but see our advice in the next section. As you harvest your lettuce, firm down soil they were in and sow a few more lettuce seeds in their place. Doing this you can get two or three crops of lettuce from the same area within a season. A very economical use of valuable space. For a demonstration of how to sow lettuce click the video below. Apologies for the background noise but the commentary is still audible. Use a seed marker to draw out a straight line groove very shallowly in the soil surface. Lightly sprinkle some seeds into the groove. Lettuce germinate quite well so don't waste the seed by sowing too heavily. If you do the task of thinning out the lettuce at a later stage will be more difficult. The seed is very small so it's impossible to be precise but sowing one seed every one centimetre (third of an inch) will be fine. If you are sowing more than one row of lettuce in a raised bed then each row should be about 20cm / 8in apart. Use seed markers to identify the variety and position of the seeds. Take some fine soil / compost from the surrounding area and sprinkle it over the seeds. The principle is to just cover the seeds so that they won't blow away or be eaten by birds. Gently firm the soil down over the top of the seeds and then water with a watering can. Lettuce are cool weather plants and if you are sowing seed in warm weather then do it at the end of the day so that the seeds stand their best chance of germination in the cooler temperatures overnight. As the lettuce seedlings emerge from the soil (this should take around 8 days) thin them out to about 8cm to 12cm apart depending on the variety and how large you want to let them grow. The three lettuce varieties suggested in the previous paragraph are compact plants so thin the seedlings to 8cm, larger varieties should be thinned to 12cm. In fact, the final distance between each lettuce should be twice that above but read the next paragraph. When the lettuce grow and start to touch each other, then thin out every other lettuce. These thinned, semi-grown lettuce are delicious, tender and sweet, so eat them rather than throw them away. One or two of these thinned lettuce is more than enough for one person. As with all vegetables, keep the site weed-free, the less competition your lettuce have, the quicker and healthier they will grow. Water is very important for lettuce, a lack of it will cause them to bolt. Bolting occurs when the centre of the lettuce starts to grow upwards very quickly - the lettuce are starting to produce seed at this point and the leaves will quickly begin to taste bitter. The best time to water lettuce is at the warmest time of the day, this cools them off and lessens the risk of mould infections. 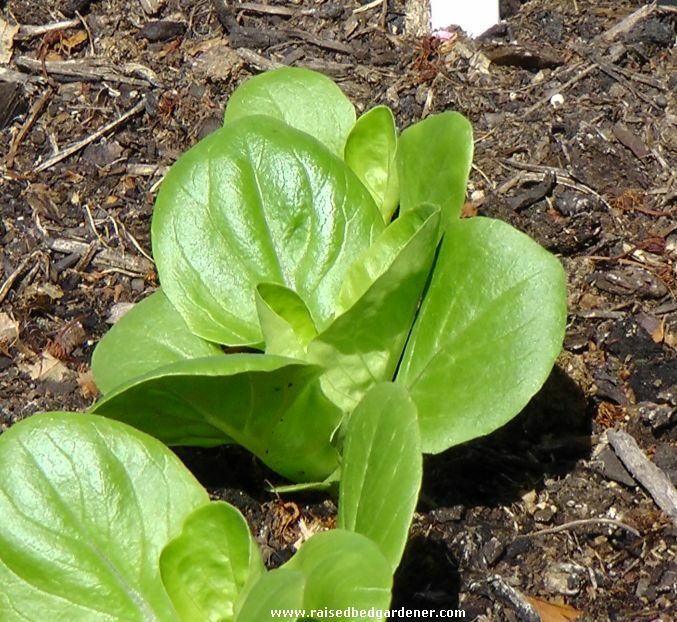 When grown in open land lettuce should only be fed if the soil is poor. But in a raised bed our normal feeding program for raised beds and containers will be fine. Click here for our feeding program. Simply grip the plant with your hand as near to the soil as possible, and pull the lettuce up with the roots. We suggest harvesting lettuce when it is young, these are the tastiest and sweetest. When you have harvested half a row, sow more seeds in the free part of the row as suggested above. Lettuce doesn't keep for very long but stores best in the fridge with the roots still attached. The best advice is to harvest young and only harvest what you need that day. Do you ever woder why supermarket lettuce lasts so much longer compared to home grown lettuce? It's because your lettuce grown at home is natural and has not been treated with an array of chemicals.